"Confessions" of the Scharf Children. 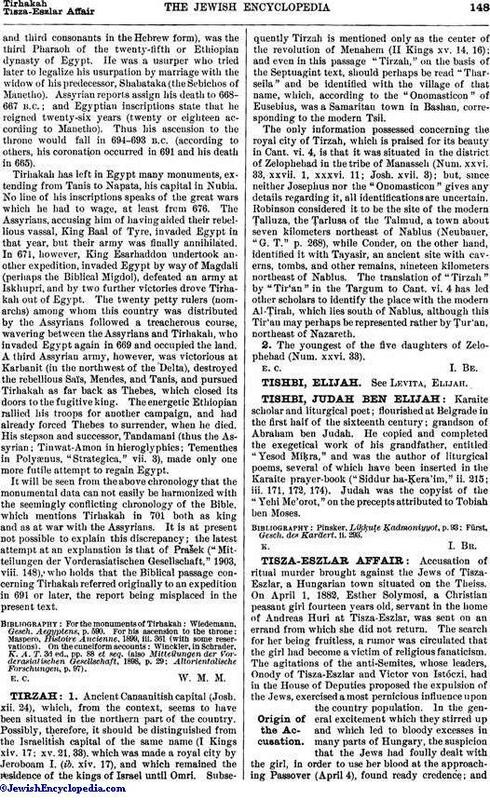 Accusation of ritual murder brought against the Jews of Tisza-Eszlar, a Hungarian town situated on the Theiss. On April 1, 1882, Esther Solymosi, a Christian peasant girl fourteen years old, servant in the home of Andreas Huri at Tisza-Eszlar, was sent on an errand from which she did not return. The search for her being fruitless, a rumor was circulated that the girl had become a victim of religious fanaticism. The agitations of the anti-Semites, whose leaders, Onody of Tisza-Eszlar and Victor von Istóczi, had in the House of Deputies proposed the expulsion of the Jews, exercised a most pernicious influence upon the country population. In the general excitement which they stirred up and which led to bloody excesses in many parts of Hungary, the suspicion that the Jews had foully dealt with the girl, in order to use her blood at the approaching Passover (April 4), found ready credence; andon May 4 the alarmed mother accused the Jews before the local judge of having killed her daughter, and urged him to hold an investigation. On May 19 the county court of Nyireghyhaza sent the notary Bary to act as examining judge at Tisza-Eszlar. After having placed the suspected Jews under the surveillance of the police, Bary began his inquiry with Samuel, the five-year-old son of the synagogue sexton Josef Scharf. The babble of this child, from whom by means of money presents and pieces of sugar some women and girls had elicited the statement that his father had called Esther into his house and pinioned her, and that the slaughterer ("shoḥeṭ") had cut off her head, was the point at issue in all the proceedings. Before Bary the boy stated that in the presence of his father and other men the slaughterer had made an incision in the girl's neck, while he himself and his brother Moriz had received the blood in a plate. The father, as well as Moriz, who was nearly fourteen years old, and the other suspected persons, denied any knowledge of the disappearance of the girl and of her conjectured murder. On May 19 Scharf and his wife were arrested; Moriz repeated his statement, and said in addition that he had never known anything about the missing girl, not even from hearsay. On the evening of that day Moriz was given in charge of Recszy, the commissary of safety, who took him to his country house in NagyFalu, where the court clerk, Peczely, received orders to watch over the boy's safety. Peczely, a brutish man who had served twelve years in jail for murder, connived with Recszy to make Moriz the instrument of a blood accusation. 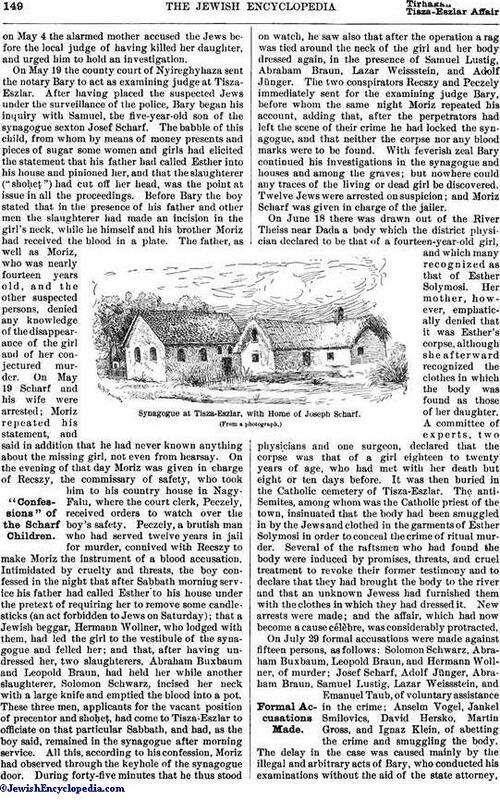 Intimidated by cruelty and threats, the boy confessed in the night that after Sabbath morning service his father had called Esther to his house under the pretext of requiring her to remove some candlesticks (an act forbidden to Jews on Saturday); that a Jewish beggar, Hermann Wollner, who lodged with them, had led the girl to the vestibule of the synagogue and felled her; and that, after having undressed her, two slaughterers, Abraham Buxbaum and Leopold Braun, had held her while another slaughterer, Solomon Schwarz, incised her neck with a large knife and emptied the blood into a pot. 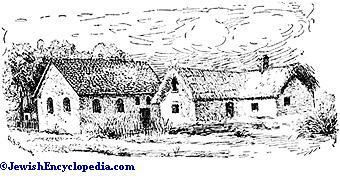 These three men, applicants for the vacant position of precentor and shoḥeṭ, had come to Tisza-Eszlar to officiate on that particular Sabbath, and had, as the boy said, remained in the synagogue after morning service. All this, according to his confession, Moriz had observed through the keyhole of the synagogue door. During forty-five minutes that he thus stood on watch, he saw also that after the operation a rag was tied around the neck of the girl and her body dressed again, in the presence of Samuel Lustig, Abraham Braun, Lazar Weissstein, and Adolf Jünger. The two conspirators Recszy and Peczely immediately sent for the examining judge Bary, before whom the same night Moriz repeated his account, adding that, after the perpetrators had left the scene of their crime he had locked the synagogue, and that neither the corpse nor any blood marks were to be found. With feverish zeal Bary continued his investigations in the synagogue and houses and among the graves; but nowhere could any traces of the living or dead girl be discovered. Twelve Jews were arrested on suspicion; and Moriz Scharf was given in charge of the jailer. On June 18 there was drawn out of the River Theiss near Dada a body which the district physician declared to be that of a fourteen-year-old girl, and which many recognized as that of Esther Solymosi. Her mother, however, emphatically denied that it was Esther's corpse, although she afterward recognized the clothes in which the body was found as those of her daughter. A committee of experts, two physicians and one surgeon, declared that the corpse was that of a girl eighteen to twenty years of age, who had met with her death but eight or ten days before. It was then buried in the Catholic cemetery of Tisza-Eszlar. The anti-Semites, among whom was the Catholic priest of the town, insinuated that the body had been smuggled in by the Jews and clothed in the garments of Esther Solymosi in order to conceal the crime of ritual murder. Several of the raftsmen who had found the body were induced by promises, threats, and cruel treatment to revoke their former testimony and to declare that they had brought the body to the river and that an unknown Jewess had furnished them with the clothes in which they had dressed it. New arrests were made; and the affair, which had now become a cause célèbre, was considerably protracted. Synagogue at Tisza-Eszlar, with Home of Joseph Scharf. (From a photograph. )Formal Accusations Made. On July 29 formal accusations were made against fifteen persons, as follows: Solomon Schwarz, Abraham Buxbaum, Leopold Braun, and Hermann Wollner, of murder; Josef Scharf, Adolf Jünger, Abraham Braun, Samuel Lustig, Lazar Weissstein, and Emanuel Taub, of voluntary assistance in the crime; Anselm Vogel, Jankel Smilovics, David Hersko, Martin Gross, and Ignaz Klein, of abetting the crime and smuggling the body. The delay in the case was caused mainly by the illegal and arbitrary acts of Bary, who conducted his examinations without the aid of the state attorney,wrote without witnesses the minutes of the proceedings, and tortured the accused and suspected. By order of the government, Moriz Scharf was given in charge of the district bailiff, who placed him in the custody of the warden Henter; thus removed from contact with his coreligionists, he was entirely under the influence of their adversaries, and received instructions as to the testimony to be given by him at the trial. The accused were defended by Karl Eötvös, journalist and member of the House of Deputies, with whom were associated the advocates B. Friedmann, Alexander Funtak, Max Szekely of Budapest, and Ignaz Heumann of Nyireghyhaza, the seat of the county court before which the case was tried. In a petition to Minister of Justice Pauler, Eötvös protested against the system of torture practised by Bary, Recszy, and Peczely; but this protest had little effect upon that official. The affair was so long drawn out that State Attorney Kozma of Budapest went to Nyireghyhaza in September to hasten the examination. This dragging on of the proceedings attracted general attention. The country was greatly agitated. A number of pamphlets appealed to the passions of the people, and attempted to establish the guilt of the accused. Louis Kossuth, then living in exile at Turin, raised his powerful voice to castigate the action of the authorities and to deprecate this stirring up of medieval prejudices. The suspicion of ritual murder, he considered, was a disgrace to Hungary; to represent as a racial crime or as a ritual crime a murder which at the worst was an individual one was, he said, unworthy of modern civilization. This cry of indignation from the veteran patriot was strangely in contrast with the fury of persecution and prejudice which raged throughout the country and which was echoed in the House of Deputies. An interpellation addressed to the minister of justice by the deputy Ernest Mezei in Nov., 1882, called forth exciting scenes. The attorney-general Havas was then sent to Nyireghyhaza, and he found that, despite the official declaration of the examining judge, the accused had not had a single hearing. He released some prisoners; but, realizing that he was hampered by powerful influences in his endeavor to accelerate the affair, he offered his resignation, which was readily accepted. In the middle of November the wife of Josef Scharf was set free, her husband and the other prisoners being still detained. At the request of the defending lawyers the body found in the Theiss was exhumed (Dec. 7) and reexamined by three professors of medicine at the University of Budapest—Schenthauer, Belky, and Mihalkovics. They found that the opinion of the members of the former committee of examination had no scientific basis, and later, before the court, they taxed them with gross ignorance: the body was too much decayed to allow a positive judgment. The fact that the corpse was not claimed by any one, left no doubt in their opinion, however, that it was that of Esther Solymosi; and as the neck was not cut, no ritual murder could have been committed. On June 17, 1883, the last act in this shameful affair began before the court of Nyireghyhaza. Judge Francis Korniss presided, Eduard Szeyffert acting as state attorney. Although the testimony of Moriz Scharf was the only basis of the accusation, the court held thirty sessions to examine the case in all its details; and many witnesses were heard. The glaring contradictions of the boy despite the careful training he had received, and the falsity of his accusation as exposed by a local inspection of the alleged scene of the murder made by the court in Tisza-Eszlar on July 16, resulted, as was inevitable, in the unanimous acquittal of the accused (Aug. 3). Szalay, the attorney for the widow Solymosi, in a speech full of bitter invectives, appealed against the decision; but the supreme court rejected his appeal and confirmed the verdict of the county court. The youthful accuser whom the maneuvers of the anti-Semites had alienated from his faith and his coreligionists, and whose filial feelings they had suppressed, returned to his parents, who gladly received him. Moriz fully redeemed his past: he supported his father until the death of the latter (1905). The verdict of acquittal and the deliverance of the prisoners, most of whom had languished fifteen months in prison, were the signal for uprisings in Presburg, Budapest, and other parts of Hungary. 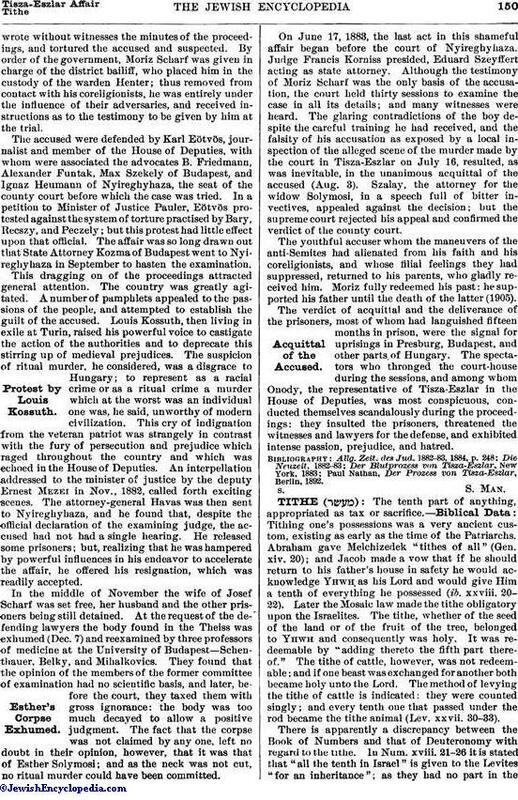 The spectators who thronged the court-house during the sessions, and among whom Onody, the representative of Tisza-Eszlar in the House of Deputies, was most conspicuous, conducted themselves scandalously during the proceedings: they insulted the prisoners, threatened the witnesses and lawyers for the defense, and exhibited intense passion, prejudice, and hatred. Paul Nathan, Der Prozess von Tisza-Eszlar, Berlin, 1892.